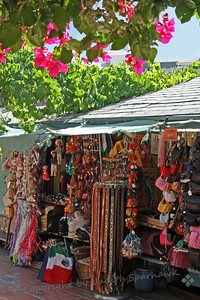 Olvera Street is a few block area that was the birthplace of Los Angeles. 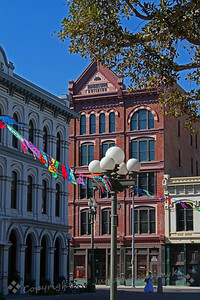 It is now an Historic Park, with a street marketplace, restaurants, shops, an active historic church and several other historic buildings. Entertainment is provided, including musical and dance performances. A troupe of Aztec dancers perform regularly. This is one of the places in Los Angeles that offers an annual Dia de los Muertos celebration. 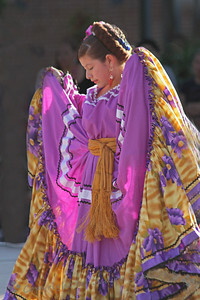 Dancing Beauty ~ One of the dance group performing Mexican dances in the pavillion at Olvera Street, Los Angeles, California. 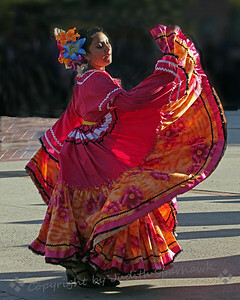 Dancing in the Square ~ This was one of the dancers performing Mexican dances in the pavillion at Olvera Street in Los Angeles. 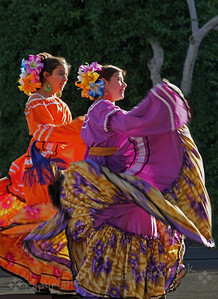 Dancing Duo ~ Two of the dancers performing Mexican dances in the pavillion at Olvera Street in Los Angeles. 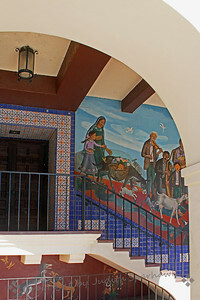 ~ This view shows part of the mural of Blessing the Animals, on one of the Olvera Street buildings. 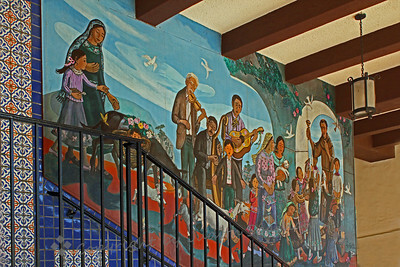 Through the Arch ~ The mural is part of one showing the Blessing the Animals, on an Olvera Street building. I liked the combination of arches, rafters, stairway. Buildings of Olvera Street ~ I went up to Olvera Street in Los Angeles for the Day of the Dead celebration. There wasn't too much going on while I was there, so enjoyed shooting some architectural details. 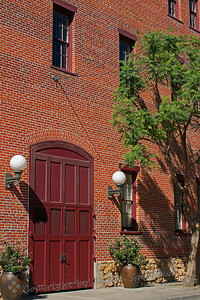 ~ Looking down a side street at Olvera Street, I saw this old brick building with doors, windows, lights. I liked the look of it. 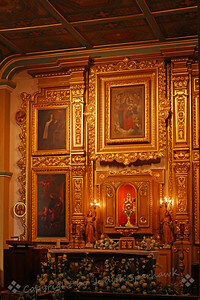 ~ On Saturdays the church at Olvera Street holds baptisms and first communions. 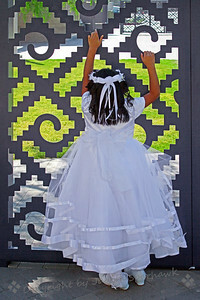 Many children of various ages come dressed in their fancy white dresses or little white suits, and wait in line with their parents for their own ceremony. This girl was near by the church, looking through the ornate metal fence; I liked the juxtaposition of soft against hard. Olvera Street Marketplace ~ This is just one of the many vendor booths set up along the street, offering toys, clothes, leather, and various novelty items. 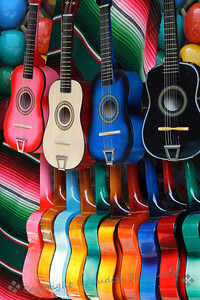 Guitars 1-2-3-4 ~ Another version of the brightly colored guitar displays on Olvera Street. The market is a feast of colors and shapes, overlaid by the aroma of Mexican food being served nearby. 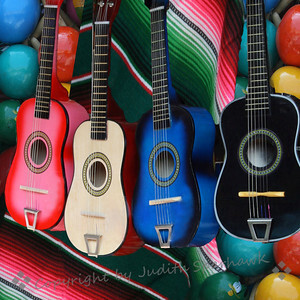 Crazy For Color ~ I have always been attracted to the brightly colored guitars for sale at the vendors along Olvera Street. I have photographed them several times; occasionally they are displayed in a pleasing arrangement that just begs a picture. 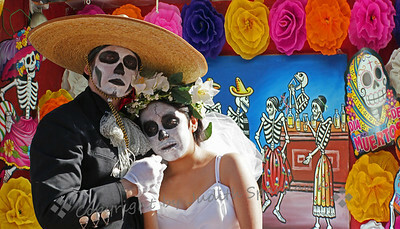 Day of the Dead Bride and Groom ~ This is a composite of the bride and groom couple in one of the musical performances at the pavillion at Olvera Street, plus a decorative mural at one of the shops. 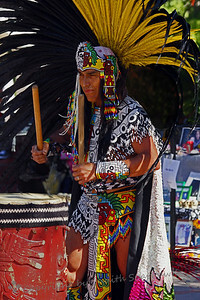 Aztec Dancer Drummer ~ The dances are accompanied with rhythmic drumbeats, by this large drum or smaller drums carried by the dancers. 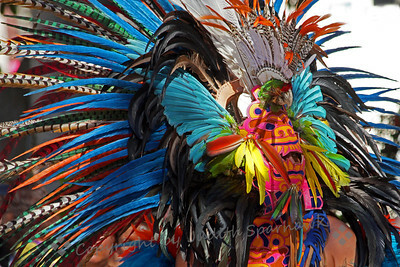 Aztec Dancer with Mask ~ This dancer wore an elaborate headdress that included a mask. 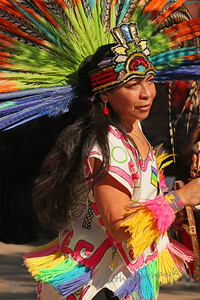 Aztec Dancer ~ One of a troupe of dancers that perform regularly at the Olvera Street pavillion. 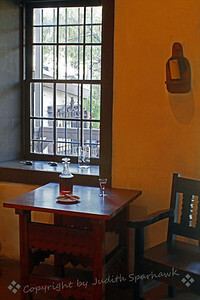 Sit Awhile ~ This image is from the interior of the Avila Adobe House, the oldest existing house in Los Angeles. It was built in 1818, and was renovated in the 1920's. 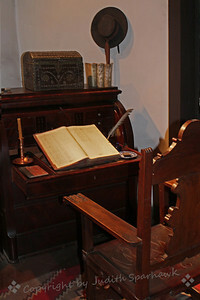 It now serves as a museum, and was restored to the way it looked in the 1840's. 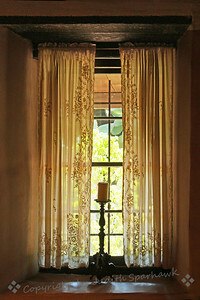 Avila Window ~This image is from the interior of the Avila Adobe House, the oldest existing house in Los Angeles. It was built in 1818, and was renovated in the 1920's. It now serves as a museum, and was restored to the way it looked in the 1840's. 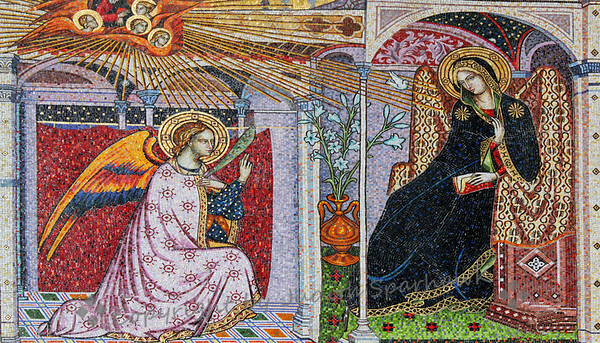 ~ This image is from the interior courtyard of the Avila Adobe House, the oldest existing house in Los Angeles. It was built in 1818, and was renovated in the 1920's. It now serves as a museum, and was restored to the way it looked in the 1840's. 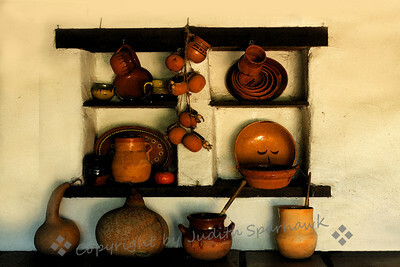 ~ This image is from the interior of the Avila Adobe House, the oldest existing house in Los Angeles. It was built in 1818, and was renovated in the 1920's. It now serves as a museum, and was restored to the way it looked in the 1840's. 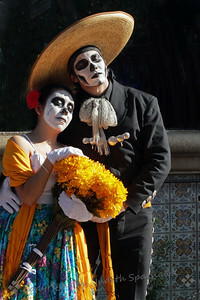 Couple at Dia de los Muertos ~ In celebration of the Day of the Dead there was continuing entertainment, including Aztec Dancers, Mariachi Bands, Singers, and a variety of musical play enactments. This engaging couple was in one of the plays. 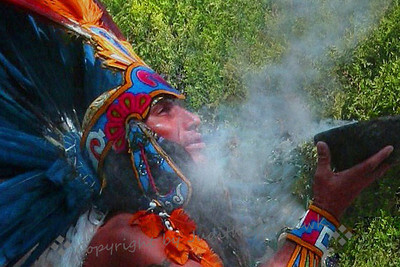 ~ A moment captured during the dances of an Aztec Dance Troupe.